Spiderpodium Travel Dock (Arachnophobes Might Want To Look Away) | OhGizmo! It can’t be easy to make your product stand out in the vast ocean of iPod & iPhone accessories. 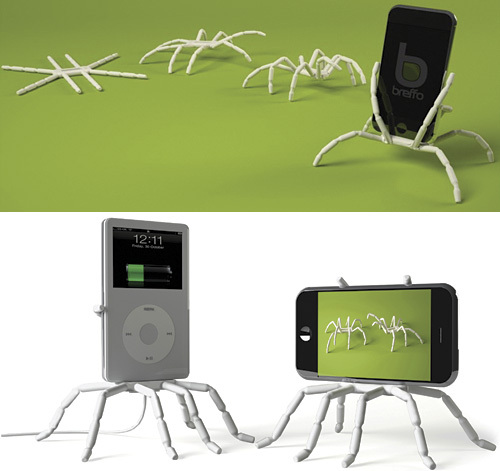 But Breffo manages to do just that with their rather unique Spiderpodium, so named because of its 8 flexible notched legs which allow it to grip any compact device. It won’t do much for your laptop or iPad, but it can be used to prop up or hang smartphones, MP3 players and even compact P&S digital cameras. If you ever had one of those wire & rubber Gumby characters as a kid you won’t need to peruse the instruction manual to figure out how to use it, and at $19.99 I’d say it’s about $10 above being an impulse buy. Hmmnn very nice concept. It sure looks very useful for small gadgets but Ihope they have a much larger design for tablets.